The 19-year-old defendant got behind the wheel after drinking "six or seven cups of beer"
A teenager from Deepcut who lost control of his mother's car on the A3 after drinking at a party has been disqualified from driving and fined. Harry Samuels, of Crofters Close, pleaded guilty to drink driving at Guildford Magistrates' Court. Prosecutor Nick Wilson told the court how at around 2am on Saturday June 22 this year, police responded to reports of a crash on the A3 southbound carriageway at Guildford. 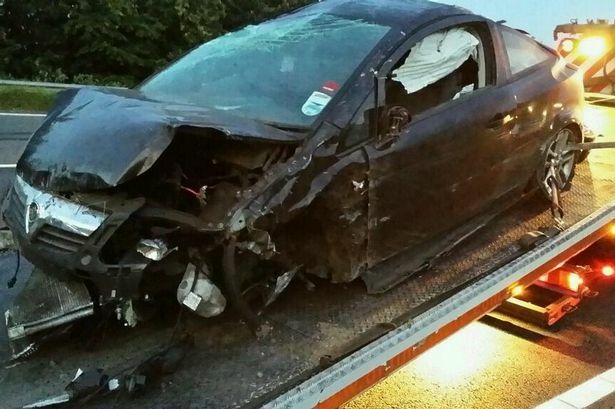 When they arrived officers found Samuels, 19, standing by the verge having lost control of the Vauxhall Corsa, colliding with the central reservation crash barrier and causing the vehicle to roll. They administered a roadside breath test which Samuels failed, posting a reading of more than double the legal alcohol limit. The defendant was arrested and gave a full confession, saying he thought the car had crashed because of a faulty tyre, however he did not rule out that his being over the drink-drive limit had contributed to the accident. Keji Kuku, defending, said his client was "very remorseful". He told the court that on the night of the incident, Samuels had attended an 18th birthday party in Weybridge with a friend, with whom he had arranged to stay afterwards. An incident occurred which caused the party to abruptly finish, and the defendant lost contact with his friend. Mr Kuku said Samuels had walked for about half-an-hour while trying to order a taxi, but because he could not properly describe where he was no-one agreed to pick him up. Eventually he got into his car, which he had borrowed from his mother and driven to Weybridge, and attempted to drive home. The court heard the crash happened because the defendant felt the car veer violently to the left and had corrected to the right. He had drunk "six or seven cups of beer" at the party. "He made the wrong decision to get behind the wheel," said Mr Kuku. "He regrets that decision." The court heard Samuels was a person of previous good character whose prospects of promotion at work would be damaged while he did not have a driving licence. Chair of the magistrates, Jon Curtis, disqualified the defendant from driving for 19 months, but gave him the opportunity to reduce the period of the ban by four months if he undertook a drink driver awareness course. Mr Curtis fined Samuels £360 for the offence, imposed a costs order of £85 and a victim surcharge of £36, telling the defendant he would have to pay the money within 14 days. Another DUI crash where a teen was involved. I truly feel we need to counsel the younger generation far more than often. My friend works with a DUI lawyer and tells me majority of their clients are in late teens or early 20s which is quite scary.